Thinking of using the SAP Universal Worklist? Read tips on best practices for leveraging it to simplify the user experience. The Universal Worklist (UWL) is an SAP-provided technology enabled via SAP’s Enterprise Portal that acts as a single consistent place for SAP users to manage their work. Rather than managing multiple inboxes (e.g., SAP inbox in each SAP system), UWL users have a one-stop shop for managing work items such as SAP Business Workflow tasks, collaboration tasks, alerts, Knowledge Management notifications, and Guided Procedure actions. The UWL enables users to make direct decisions and actions without logging into a back-end SAP system such as ECC. It also saves developers time by allowing them to bypass the creation of an application-specific inbox. If this functionality doesn’t have you excited about utilizing the UWL in your organization, there are plenty of SAP-provided advanced features, as well flexibility for providing organization-specific customizations. For example, UWL users are given the ability to personalize the appearance of the worklist to meet their own individual working styles with features such as changing the column order and sorting options. Users can also do things such as add attachments to work items, view the history of workflows, set up substitutes for reviewing work items (great for executive admins), and forward work items to other users, to name a few. Customization options are almost unlimited. Simple features such as creating subviews based on different types of tasks (e.g., only display travel expense reports in a travel subview) and forcing users to enter comments when rejecting business workflow items can be easily added by someone with UWL skills. Advanced features include such things as launching other SAP Web applications (both Java Web Dynpro and ABAP Web Dynpro), launching transactions via the SAP GUI for HTML, hiding unwanted features (e.g., prevent users from forwarding work items to end users), adding tasks from non-SAP systems using the UWL Java API, and mass processing business workflow tasks. My organization decided to implement the UWL during our first SAP implementation in order to minimize the rollout of the SAP GUI client. Many of our workflow approvers had no need to transact directly in SAP ECC, so we provided them access to the UWL on the Enterprise Portal and saved ourselves some headaches involved in client software rollouts. Our initial implementation of the UWL forced our approvers to launch transactions via the SAP GUI for HTML for reviewing documents linked to ECC transactions. This setup required users to go through more steps for approving workflow items than they experienced in the legacy applications we were replacing. To minimize the impact on our end users and to provide them a more intuitive user experience, we implemented some advanced UWL customizations to provide a button on the workflow items that would allow users to retrieve -- with one click -- the document linked to the ECC transaction from our enterprise Document Management System. Although we’ve had many success stories in our organization with the UWL, we have experienced some of its limitations. For example, we were given a requirement to allow approvers to change the cost center assigned to specific workflow items. Although we tried many different options to accept a cost center input directly from the UWL and use the data to change the object in ECC, we didn’t find a usable solution. We moved forward with developing a custom Web Dynpro application that approvers could launch directly from the work item in the UWL. This custom application allowed approvers to modify the cost center and then approve the work item. We experienced a second UWL limitation handling comments entered from the UWL when rejecting work items. 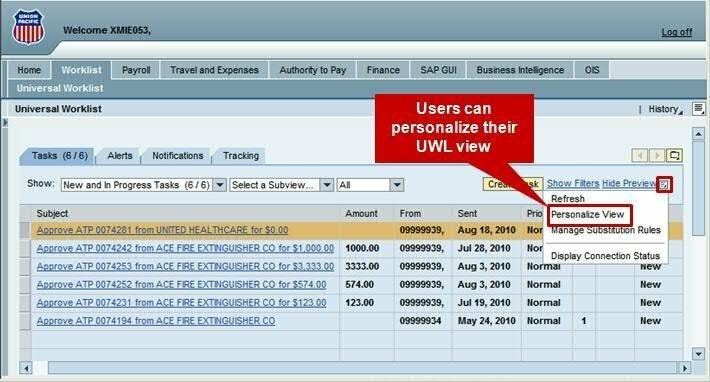 Although SAP provides an easily enabled UWL feature to capture comments, the comments are stored in the workflow object and aren’t easily retrievable. We were given a requirement to make the comments input via the UWL available for reporting purposes. To accommodate this requirement, we had to develop a custom ABAP program to pull the comments from the workflow object and store them in a custom Z table so that reports that included the comments could be generated. As more and more organizations implement the SAP Enterprise Portal, usage of the UWL should continue to grow. Basic capabilities are available out of the box (with some minimal Basis configuration required to connect the UWL to the back-end SAP systems via the SAP Office Notification Connector, SONiC), making it easy for organizations new to the UWL to get up and running quickly. Not only is this an easy way to simplify the user experience for interacting with SAP business workflows and other SAP tasks, it opens the door for implementing advanced customizations for an even better user experience. Justin Snyder, CISSP, CISA, GCIA, is an SAP project manager for Union Pacific Railroad with more than three years of SAP experience and more than 11 years of experience in the technology arena. Justin has developed and taught security courses, and his recent SAP speaking engagements include SAPPHIRE on the UWL and SAP TechEd on GRC.